Anyone growing hardy kiwi? I'm in Maine and I wondering if it's worth the investment of building a trellis and getting maybe 2 females and 1 male. The usual Kiwis are the Hayward types which do require male and female plants and they do need rather a lot of room. This is a hairless variety which is completely self-fertile. It's not so vigorous and comes in either a red or green fruited variety. I have two kiwi vines I inherited when I moved to the northern California coast. The vines are very vigorous, full of blooms and leaf out beautifully, but the brown fruit never becomes fully ripened. We are near the coast with cooler weather and fog. The vines are on a huge heavy duty metal structure to hold the weight of the vines. 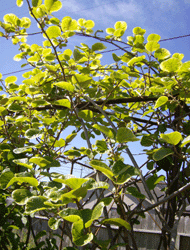 If anyone has any other information to share about the general care of kiwi vines I'd be glad to hear about it. Here is a photo of my kiwi vines. Reviving a hardy kiwi plant?